This CopyCat Shake ‘N Bake Recipe is going to save you some $$’s. Season your pork or chicken with this do it yourself recipe for a fraction of the cost of store bought. My entire family has always enjoyed Shake & Bake chicken and pork. The kids will always come back for seconds. For years before I learned to cook, I would make a recipe using Shake ‘n Bake using the store bought boxes. 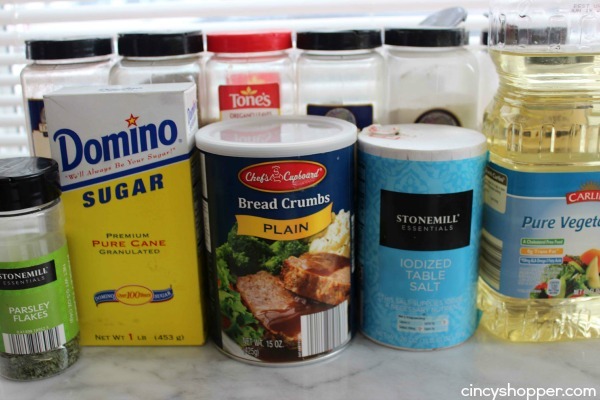 After I had to get frugal with my shopping, I quit buying the popular bread crumb mixture. Those little boxes add on quite an expense to our family meals. They are just way too expensive for my grocery budget. Occasionally, I will spot a sale and buy a box or two. 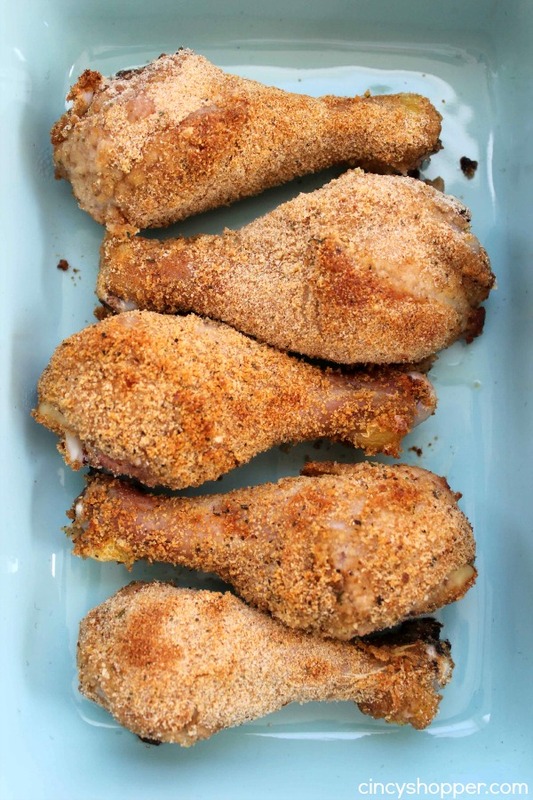 Last week, my boys spotted chicken legs while we were grocery shopping and asked when the next time we could have that chicken with the crumbs. I quickly snagged a package of chicken legs for the kiddos and some pork chops for the hubby and I. 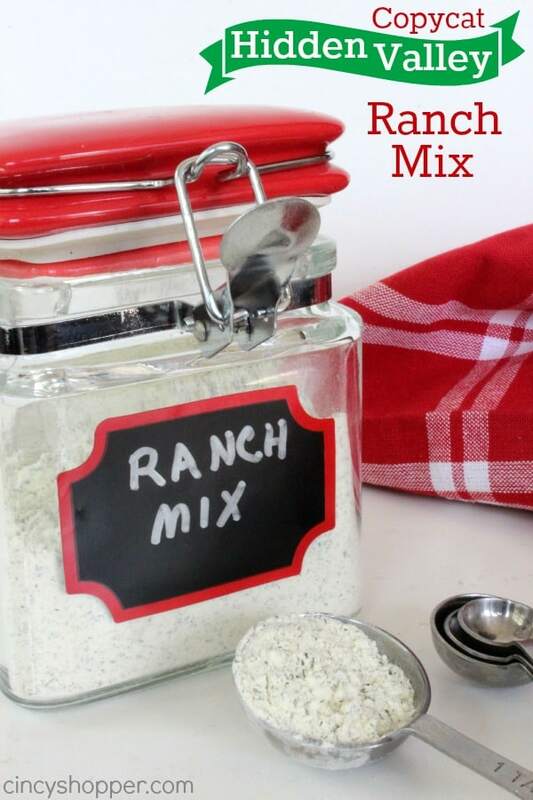 We have really done well with making our CopyCat Hidden Valley Ranch Mix , Copycat Good Seasons Italian Mix, and also the CopyCat Lipton Onion Mix so, why not attempt to make our own Shake ‘N Bake Recipe? Just as I had thought…. It was not difficult at all. Plus making our own Shake ‘N Bake was super inexpensive. I made enough to keep handy in the pantry. It will be great to have another mix handy to throw a dinner together on the fly. Do not let this image of ingredients scare you. This recipe takes just a few minutes to put together. You most likely have all these spices right in your cabinet. 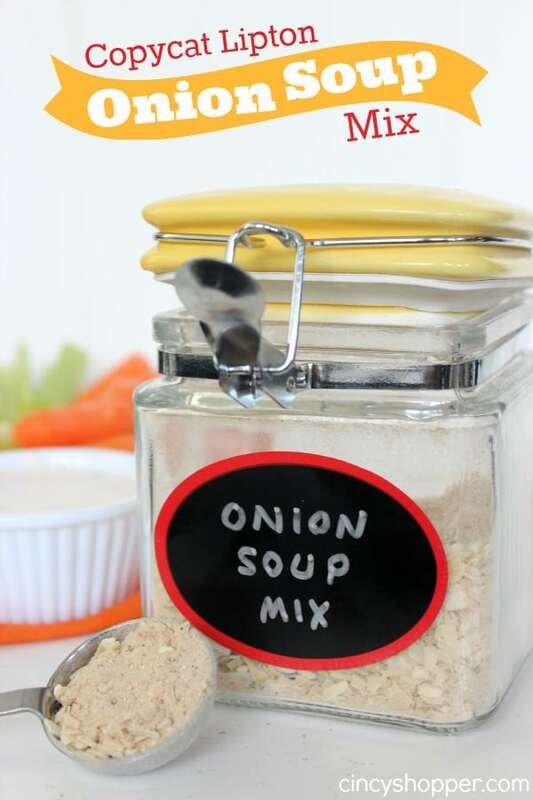 Just grab your measuring cups and spoons and you will have this mix ready in no time at all. 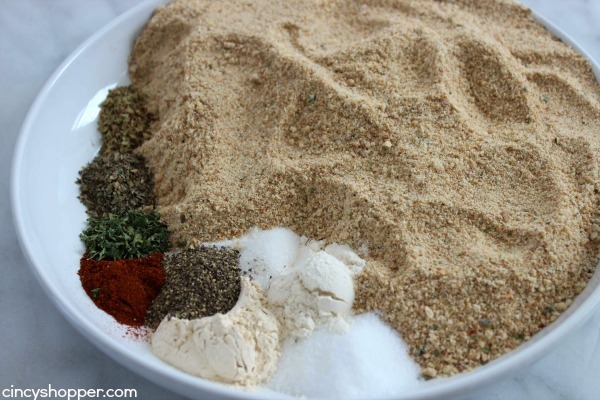 Combine all ingredients and mix until well blended and there are no big clumps. Preheat oven to 400 for Pork or 425 for Chicken. Pour some of mixture to large zippered bag. Wet each piece of meat and shake off excess water. Place in bag and shake to coat. Shake off excess breading place on baking sheet. Bake pork chops for 15-20 minutes. 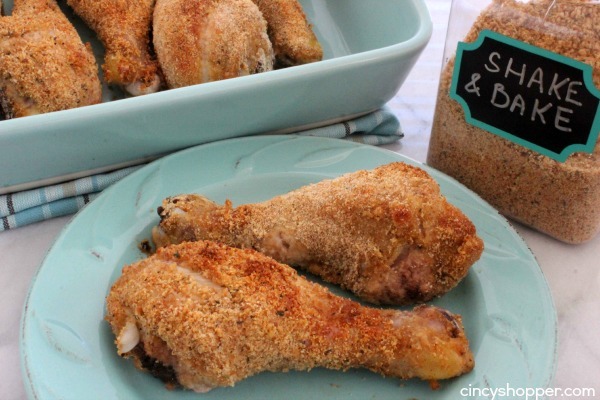 Bake bone-in chicken for 40-45 minutes. 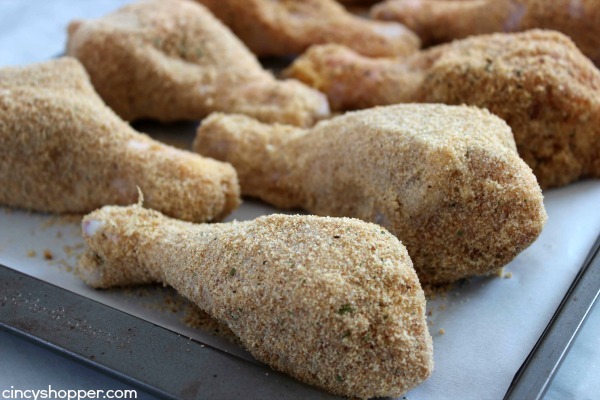 Bake boneless chicken for 20-25 minutes. 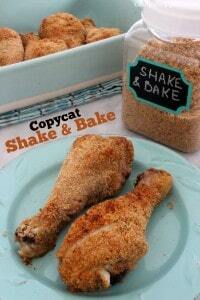 This recipe for Shake ‘N Bake was super tasty. The meat had a slight crisp and the flavors were perfect. Just as I suspected… the kiddos were all back for seconds and a couple of them came back for thirds. The hubby and I enjoyed the mix on our pork too. My hub thought it was actually better than the store bought boxed stuff. 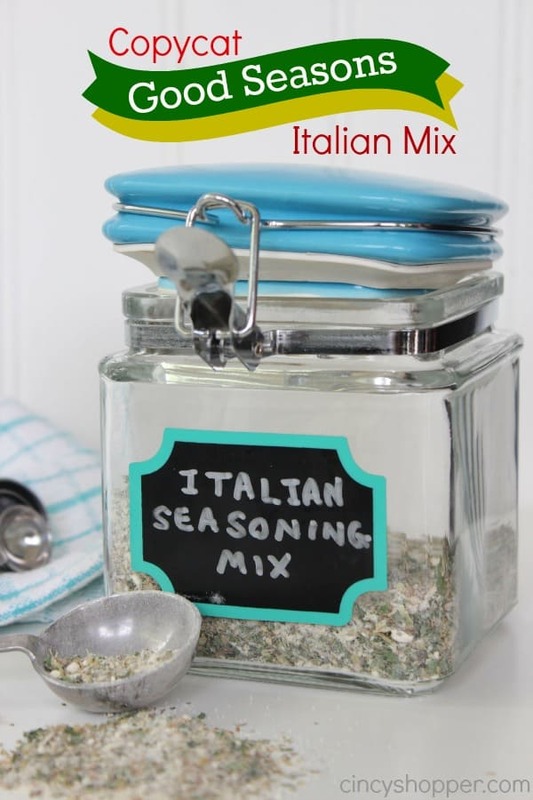 If you like making your own mixes at home you may want to check out these recipes too! This looks fantastic! Pinning now! found you on the Weekend re-treat link party! Can’t wait to try this! I made this the other day for a Bible study group at my house and it was SO GOOD! Just like I remember having when I was a kid! Question: how long does the mixture last on your shelf? 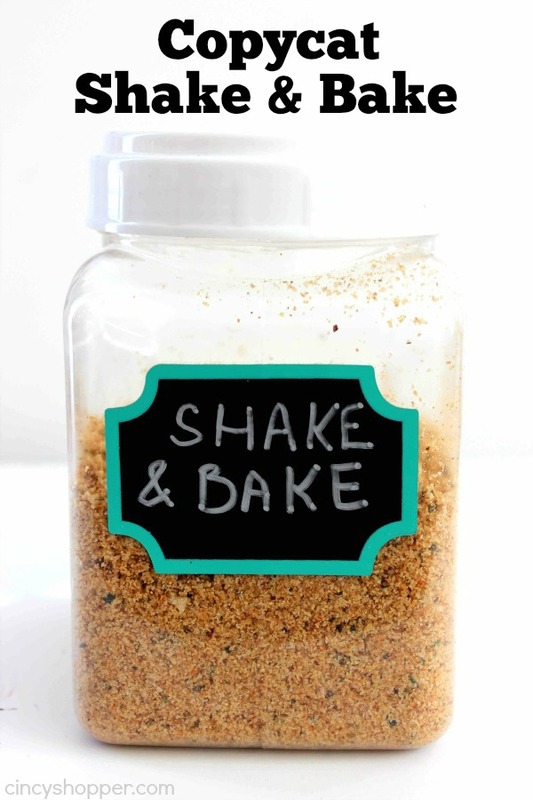 Does the shake and bake need to be stored in the refrigerator? Where does the 1/4 cup of oil come in? Me too. It reads like it’s added to all the other ingredients but, the store bought Shake ‘n Bake is dry. I just made this but accidentally bought Italian bread crumbs so I omitted the parsley basil and oregano. Just tasting the mixture it tastes like Shake and bake. Can’t wait to add it to the chicken for dinner tonight! You have vegetable oil do you mix that in with the dry ingredients or add it when you start to make your meal? This is a great recipe to have on hand. Great job. We included it in a recipe roundup of recipes we love. We have linked directly to your page so everyone can bookmark it and keep it on hand. My family loves this on pork chops & chicken. This is very easy & delicious weeknight meal served with vegetables & rice or potatoes. 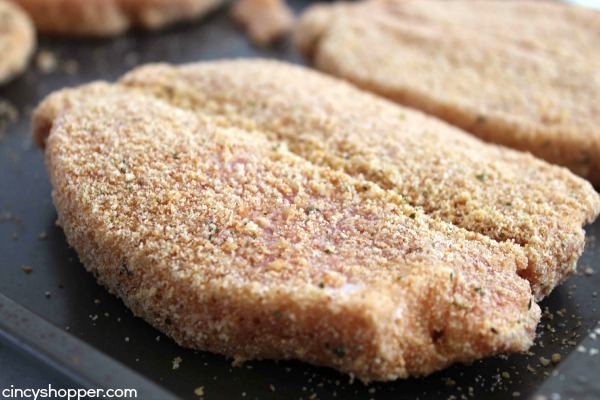 I was trying everything to get a crispy coating on my chicken or pork chops for my air fryer. I saw your site and remembered using shake and bake when the kids were little. It was perfect. I love love love it. It stayed on my chops and got crispy without drying my chop out.